Rebbetzin Esther Jungreis passed away yesterday at the age of 80. She was quite an inspiring woman. A holocaust survivor from Hunagary, she founded the kiruv organization Hineni. Rebbtzin Jungreis was the only kiruv person who I have ever hear speak who could intertwine snippets of pop culture into her lectures and get it right. She was able to meld the ancient teachings with the present and make it relevant. I was especially impressed that as a very frum woman that she embarked on such a path. At one point it was hip for 20's and 30's something singles to attend her Tuesday night lectures in order to possible meet their bashert during the socializing after the lecture. Rebbetzin Jungreis's funeral was today. Its hard to say goodbye to that spunky petite woman whose mission in life was to spread the word of the Torah . She will be missed. These kids are never going to forget this summer. I went to Camp Moshava in Wild Rose , Wisconsin. We never had any surprise guests like this back then. Yes, Pokemon Go is in Israel. Here is a video all about it. Enjoy! After reading a lot of stories of chasidim who have gone off the derech it has changed how I view them. I used to think that just by how they look that they must be on another spiritual plane . Now I realize that that same chasidic garbed individual may really be someone who is plotting their freedom from it. One cannot tell just by looking at a person's dress how sincere their actions are. Truthfully, I always believed this about people's externals. I never thought that someone's dress defined the intensity of their religious fervor . Now I believe it even more. No matter how religious or non-religious a person grows up one needs to figure out where one fits in and feels comfortable. The greatest fad right now is the Pokemon Go app. 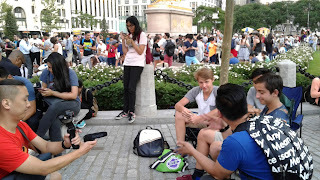 In case you have been living under a rock lately , Pokemon Go is a game on smartphones where you look for Pokemon all over the world and you find them and balls to throw at them to catch them by walking around outside. At first I brushed PG off as a mindless silly app until I thought that perhaps I should check it out . As enjoyable as PG is , its not as addictive as Candy Crush was for me . The game its self is rather silly but the fun part is finding the "poke" stops . The game is a tourist's dream. The poke stops are at stores, restauraunts, shuls, yeshivas , churches and landmarks. It makes you take notice of what institutions are around you in a way you may not have known before. It also adds a bit of knowledge about the place and when it was established. So often you walk past a place everyday and you don't realize how special or iconic it is or was. 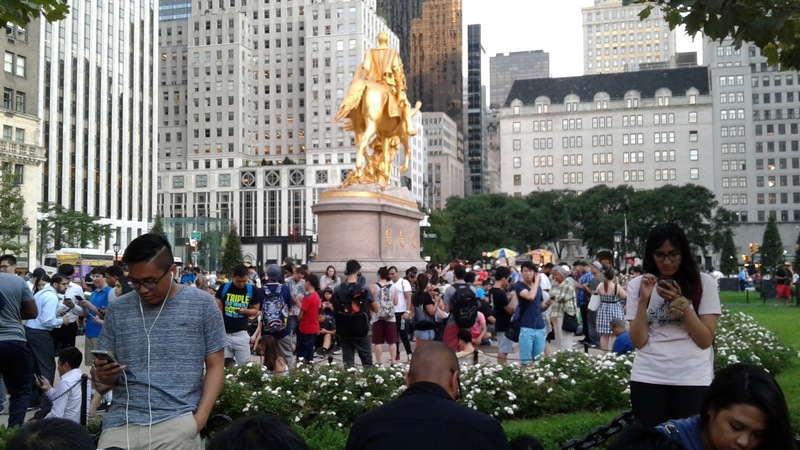 The other fun part is watching all of the people at certain choice locations who are looking for pokemons. 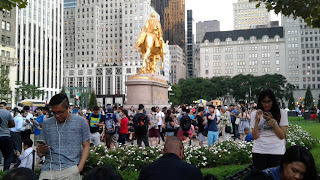 When I first saw hoards of people standing at the entrance of Central Park on Fifth Avenue I thought that there was an extraordinary boom in tourism this year. Other days it made me think that there was a train outage. When I found out that its a major poke stop for PG I was relieved and intrigued . Of course I had to take pictures. The app its self tells people to be careful while looking for poke stops. Now it can tell how fast you are moving and asks you if you are driving a car or if you are a passenger. It needs to be adjusted for New Yorkers though. When I am walking it thinks I am in a car and asks me if I am a passenger. No, PG app, I am WALKING. I don't see too many people playing PG in Midwood, but there are a lot of poke stops here. Carlos and Gabby, Ave J Q train station has two, Beit Torah , Wolf and Lamb and shorashim, Landau's shul and Pomegranate supermarket are pokemon gyms. I think that someone should make a Pokemon single's event . You would already have your smartphone there to exchange numbers with a special someone. I admit to giving in to the henna craze and trying to dye my hair with it about three weeks ago. Its very messy but very worth it not to use the chemicals. This video is one of the best I have seen yet describing the whole process. This is truly amazing. One really does not know what the extent of one's actions can set into motion! Have you ever thought you saw a recently deceased friend or relative walking down the street ? I have . Actually my friend is still alive, but very ill. No matter , I think I am seeing her walk down the street constantly , until I realize it can't be her. The thing is that I hadn't seen her for about six months before she was hospitalized for a serious illness. Its so hard to process, instead I think that I think I see her everywhere she used to be . I'm a sucker for this kind of story. We all secretly are happy to find out that someone who is not Jewish wants to be Jewish . This man is so inspiring and its so wonderful that he is one of our Jewish brethren. So many hours pass and I find myself glued to the computer . I never can believe how many hours pass. I am never bored but I always feel like I haven't accomplished much. Then again I usually haven't. I have been in the abyss that is called online. In NYC on line means one is standing in line. In computer speak online means on the Internet. I think the two meanings totally compliment each other. New Yorkers are so busy that they are online when they are online. Hah! Even if I wanted to I can't go back to the dark ages before Internet. There is no going back. I can reduce my usage though, even at the risk of experiencing boredom again. I have a new cell phone that is not as app friendly so I am online less. This is really a good thing. I find myself reading more. Ok , I read on a kindle, but I still consider a kindle low tech because I have the black and white kindle that is really just for reading. Moments pass so quickly that any way I can slow things down makes me feel better. Even moments of boredom make life seem longer in a good way . There really is no way to stop change and time , but if we are lucky we can try to maximize the time we do have. Reducing time in the abyss of the Internet will help. If only I would heed my own advice.